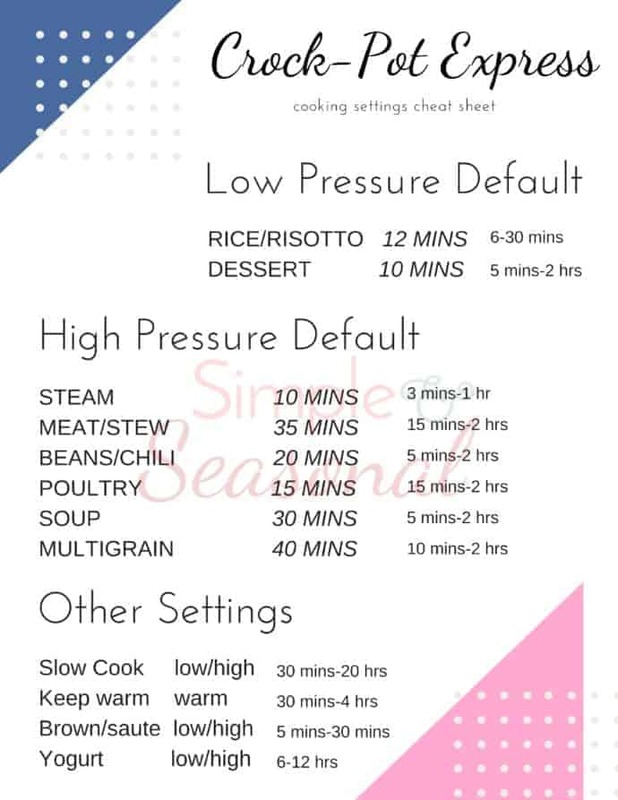 If you’re new to pressure cooking or just bought a Crockpot Express Multi-Cooker, download this handy Crockpot Express Cooking Guide for at-a-glance cooking times and pressure settings! It will make using your new appliance so much easier. This year for Christmas I got a Crockpot Express Crock Multi-Cooker (otherwise known as a Crockpot Express or CPE for short.) I am so excited to enter the world of pressure cooking! Pressure cooking has been around for ages, but these new appliances are making it safer and easier for everyday cooking. They have the added benefit of being a slow cooker and saute pan as well! Just like any new appliance, though, there’s a bit of a learning curve, so I created a printable Crockpot Express Cooking Guide to save me from having to dig out the manual every time I use it. The biggest difference between the Instant Pot and the Crockpot Express is the settings. The functions are the same, but how you access them is a bit different. On the CPE, there is no “manual” button to select the pressure. Instead, you choose one of the preset buttons for the pressure you want, and then you can adjust the time as needed. Because of that, it’s handy to know what options are available for every preset button on the Crockpot Express. This printable shows the default setting for pressure and time, with the available time adjustments. Does it have a manual setting? No, but if you choose a preset button, you can then adjust the pressure and time for your particular recipe. The Beans/Chili button is a good one because you can choose low or high it goes from 5 minutes to 2 hours. What does the Keep Warm setting do? When cooking time is completed, the Multi-Cooker automatically switches to the KEEP WARM function to prevent overcooking and to keep your cooked food warm. What is Natural Pressure Release? Otherwise known as NPR, it simply means after the cooking cycle is complete, let the CPE naturally release pressure through the bobber valve. The unit will gradually cool down on its own. Wait at least 10 minutes after cooking has completed, and then, using a kitchen utensil, flick the tab on the steam release valve to the “Release” position. The pressure has been released when steam is no longer escaping from the valve and the lid opens freely with minimal force. Only then is it safe to remove the lid and serve food. What is Quick Pressure Release? Sometimes called Quick Release or QR, using a kitchen utensil, flick the tab on the steam release valve to the “Release” setting immediately after the cooking cycle finishes. Steam will release rapidly from the steam release valve. Never use this method when cooking liquid ingredients such as casseroles, stocks and soups. Never use this method when cooking rice, as rice tends to be very delicate. What does the E6 error mean? This seems to be the most common error code that occurs, and it’s related to how hot the unit is. Often, if you use the brown/saute function first and then switch to pressure cooking, you might get this error. 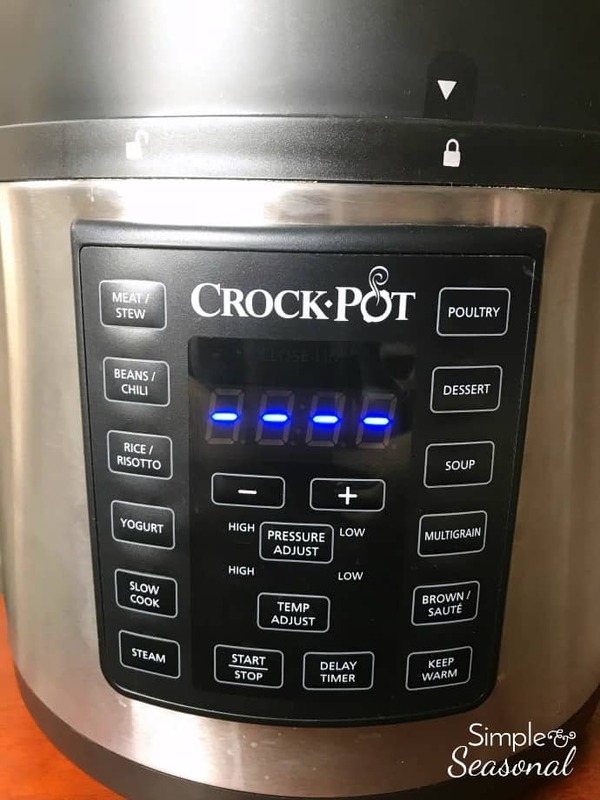 Be sure the unit is cooled completely, there’s no food stuck on the bottom, and there is enough water (at least 8 ounces) in the pot to avoid this error code. If using a pressure cooking function, ensure that the steam release valve is in the “Seal” (closed) position. If you DO get the E6 error, try pulling out the inner pot for a few minutes to let it and the unit cool a bit, then unplug the unit and plug it back in to reset. If you are getting this error code consistently, it may be a manufacturing problem, and you need to contact Crockpot Customer Service to have it replaced. They have been very helpful with trouble shooting and sending replacement parts! When pressure cooking, ensure there is a minimum of 8 oz of liquid in the Cooking Pot. Do not leave it plugged in when not in use. Make sure the CPE is kept away from cabinets and walls when in use. Do not use on the inner pot on the stove top, in the microwave, or in oven. When removing the lid, use a pot holder to grasp the handle and lift away from your body to allow steam to escape. If you’re like me, the best way to get to know any new appliance or tool is to just play around with it. Try making easy side dishes or small meals that you can master before making the entire family wait around on you for dinner. 🙂 My first attempt was macaroni and cheese, then hard boiled eggs. The pasta seems like more work than it’s worth, but the eggs were a definite winner! I’m working on adjusting several of our favorite recipes for the pressure cooker and will be sharing my results and other great recipes over the next several weeks and months. If you’re on Facebook, join our group Crockpot Express Community for support and recipes! Try these easy “starter” recipes in the Crockpot Express! If you’re still in the market for a pressure cooker and haven’t decided between the Crockpot Express or the Instant Pot, here’s a very simple “at a glance” comparison chart. How would I hard boil quail eggs? Should I use the same steps in hard boiling chicken eggs? The steps would be the same, but the time would be much less because the eggs are so much smaller. I’ve never done quail eggs so I can’t say for sure, but I’d imagine 3 minutes would probably be enough. The book that comes with the Multi cooker has a recipe for yogurt. It states to add the “yogurt starter”, but nowhere do I see the recipe for one. I would like to make Greek yogurt flavored with frozen or fresh fruit, as well as yogurt bars. Can you please help me find a recipe? Thank you so much! Is it normal for it to take around 30 minutes to HEAt before the cooking time started? Felt like forever to just get the cooking started! It depends on how full the pot is and how cold the food inside is. If you are using frozen food it definitely takes longer. Full pots of soup/stew or even pasta dishes can take quite a while as well. That’s usually why cook time is so short. The food is heating/cooking as the pot preheats. I am a new CPE user, but I noticed that my “bobber valve” does not extend up the lid when in use. Is this right or am I missing a part? I did cook a pork loin and it held pressure and came out perfect. Thank you for your help. Is the bobber valve supposed to have a rubber gasket on the inside of lid? Mine does not. I used it yesterday for the first time, I got error codes three times during cooking. Also is the word HEAt supposed to stay lit up during cooking? It never chooff of that during the cooking time. I could not tell how much cooking time was left, even after restarting three times. It is, yes. It keeps it in place. Sounds like you might be missing a part that makes the bobber valve work. That would explain why the Heat never switched to the cooking cycle. It can’t get up to pressure. I’d take it back to the store and exchange for another one. I had same problem with heat display and took it back. Haven’t tried second unit yet. Have you tried to just run a water test (no food, just water inside) to see if it will come to pressure and start a cooking cycle? I know I am doing something incorrect. Low pressure and 12 min……I get crunchy and wet, very wet rice. Brown rice takes much longer to cook than white rice does. Be sure you’re not adding too much water or broth. Keep the ratio 1:1.5 white rice to liquid. Then you also need to allow it the full NPR-so it cooks for 12 minutes and then sits for about 10 more as the pressure reduces. You do hear a bit of a “click” when that is done. Are you rinsing the rice first? That also helps to reduce the starchiness and frothy mess that can get into the steam release valve. I have heard that altitude can make a bit of difference in pressure cooking. I don’t personally have any experience with it, though. Try searching for “Instant Pot cooking at high elevation” and you should be able to find some information to help with that. I keep using different amounts of water and doing the 12 mins time on low. Nothing works. Crunchy on inside and wet on outside. So if I’m correct, I push rice button, let it do it’s thing until the time runs out. Then I let it sit for a little longer before I release the pressure valve? This is what I’ve been doing and nothing works. I have the exact same problem! Thanks for asking that question. One thing to keep in mind…if you use your pot on the counter near cabinets…when releasing pressure cover the vent with a trolded towel so the steam does not get on your cabinets and eventually ruin the finish. Goid morning! New user here! Is the steam button basically the same as the Instant Pots manual button? I see all of the recipes for instant pot that says to use the manual setting and my crockpot brand doesn’t have one. Than you for any help! Have a Merry Christmas! Yes! So sorry for the late reply-I haven’t been online much for the holidays. Any pressure button will work, but I most often use Steam, since it defaults to 10 minutes and goes as low as 3. Love your posts! As a new user, your intel is very reassuring and helpful. Thanks! Is there a stainless steel pot available for the crock pot express? Would the insta pot stainless steel pot fir the crock? Sadly, there is not. I don’t know if Crockpot will ever do that, but it’s one of the main things people ask for! There are conflicting reports about whether the IP brand pot will work. I have pics and video of some people trying it out, but the lid wouldn’t seal properly. Then someone else claimed that they use theirs all the time. I don’t them personally, and I haven’t tried it myself, so I can’t answer with 100% certainty. I want to cook boiled eggs in it. Can you please help me? I made a meatloaf in a round corningware dish and it worked perfectly. The problem was in getting the dish out of the cooker pan. There wasn’t enough space to get my fingers in between the dish and the pan to lift it out. I’m not sure the grips would have worked because the dish was so low in the pan. Is there some kind of ‘sling’ that I could put the dish into before putting it into the pan so I could use that to remove the dish. What setting do you suggest for pastas? Thank you! Those were the first two recipes I tried in my CPE too! May I join the Facebook group too?